Directions: Grab graph paper, pencil, straight-edge, and your graphing calculator. 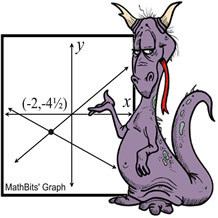 First, solve these systems graphically without your calculator. Then, use your calculator to check your results, and practice your graphing calculator skills. Beware!! 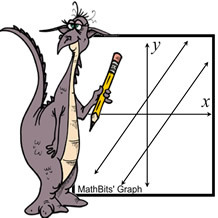 The dragons' graphs may, or may not, be correct! What is the solution of the system of equations shown in the graph at the right? 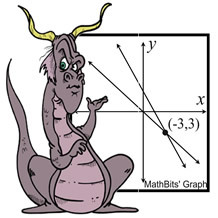 When solved graphically, which system of equations has exactly one point of intersection? 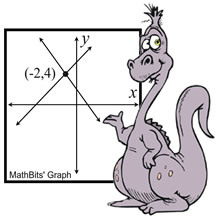 7y = -8x + 16 is graphed as shown. 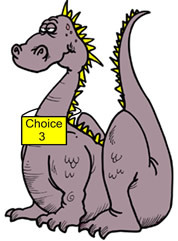 Which choice is the point of intersection? When the system shown below is solved graphically, how many ordered pairs will be in the solution set?